Hooded Top (Hoodies) give you added protection from the cold yet still look smart. Embroidered or printed with your company logo, Hooded Tops also give a great impression to your customers and tell them who you are. APS Hooded Tops are available in a wide range of colours and styles to suit your company image and at prices to suit your budget. Have a look at our on line catalogue now for the wide selection available. Or you can give us a call and APS can help you choose your Hooded Top based on the environment in which it will be used. No Logo? 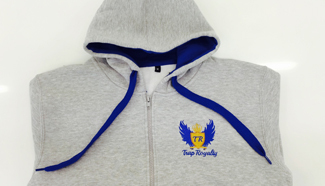 APS will also help you with logo design which we will embroider, heat seal, screen or digitally print onto your Hooded Top. We can also supply a range of sweatpants to compliment your Sweatshirt which we can also print or embroider and supply at a price to suit your budget.